Recently I blogged about using GeoJSON to create a very lean application for serving dynamic maps. To date, all of my posts have related in some way to Microsoft technologies because that is my environment, day-in, day-out, but I thought it would be interesting to create a similar solution to the last blog post using technologies I haven't used before - why? - because it's good to learn something new, and these libraries are really cool! As you would recall from last time, the objective was to create a map with an Open Street Map (OSM) base layer, which overlays the cadastral boundaries as a layer that is retrieved when the user pans or zooms around the map. The previous solution achieved this using Tile5 to render the map on the browser, and make ajax requests to an ASP.Net MVC application which would retrieve the cadastral boundaries for the current view extent from SQL Server, and return them as GeoJSON structured objects to Tile5 to render on the map. The first step in the development process was install PostgreSQL, and PostGIS and import my Queensland cadastral data into it. The spatial indexing in PostGIS is a little different from SQL Server, and is worthy of a future blog post, suffice to say there are some idiosyncrasies in my spatial queries below that warrant a second glance. Express can be installed by installing Node, and NPM (Node Package Manager), which simplifies the installation of Node based packages. Once these are installed you can install Express. The final command should show the version of Node that is installed. The final command should show the version of NPM that is installed. 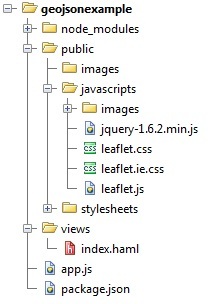 This example is so basic, with only two server actions, that the business logic has been included in the app.js file. You can see that the RetrieveCadastre action passes the body through to the function, which represents the bounds of the map to retrieve cadastral information from the database, which you can see being used to build up the SQL statement. The interesting part of the SQL statement is that it looks like it is using the same filter twice in the where expression. In fact the first part is using the && operator which instructs the query engine to use the spatial index to do an index seek using the bounding box of the filter to find features whose bounding boxes also intersect the filter. This will result in more matches than we expect because some feature's bounding rectangles will intersect our area without the shape inside actually intersecting the area, so what we do is then filter the index results such that the underlying geometries are intersecting our spatial area. For my specific purposes the first filter would be enough, but I included the example for posterity. The other interesting thing about the SQL is that the selection is returning the GeoJSON of the resulting objects using the ST_AsGeoJSON function. This is really cool because it saves me from having to parse the result into a GeoJSON structure to send back to the client. The only view I have is for displaying the initial map. As you can see it is much like the Tile5 example from last time around, but with some slight interface changes for Leaflet's differences. As you can see, the code to achieve the solution is even leaner than the previous solution, mainly due to PostGIS being able to return the database results already formatted into GeoJSON. This was a great read. 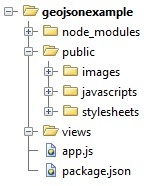 I've been needing to take a closer look at node. I thought I'd mention that in your app.js when you're building the spatial SQL, you can leave out most of line 55 as PostGIS' ST_Intersects automatically makes use of any spatial indexes you've built. Thanks for the feedback Jason. With regard to info about PostGIS and how ST_Intersects should utilise the index - I had some problems with this which is why I added the bounding box filter to the statement as well. I discussed it a little more in my latest post http://goo.gl/tJRga, but I am wondering if the issue (i.e. not using the spatial index) might have been caused by me using the geography data type instead of a geometry type. ciao, ho letto il tuo interessante articolo, premetto che non sono pratico ne di gis ne di siti web ma ci sto provando, sto usando leaflet, postgis e dreamweaver cs6 ma non so come fare, ho scaricato il tuo esempio da github e seguito tutte le tue istruzioni ma non riesco a farlo funzionare, inoltre avrei bisogno dell'index.html per vedere nel mio browser.Mi potresti aiutare o consigliare una guida ? Let the SQL injection begin! This is good stuff Todd. I just started with node.js, and I am very ESRI-based programmer, who is discovering the world of open-source outside ESRI. My target is to build a project with node.js, leaflet, and Angular to add these three technologies together. What you did is going to help me a lot. Does Nodejs work with Geoserver ? 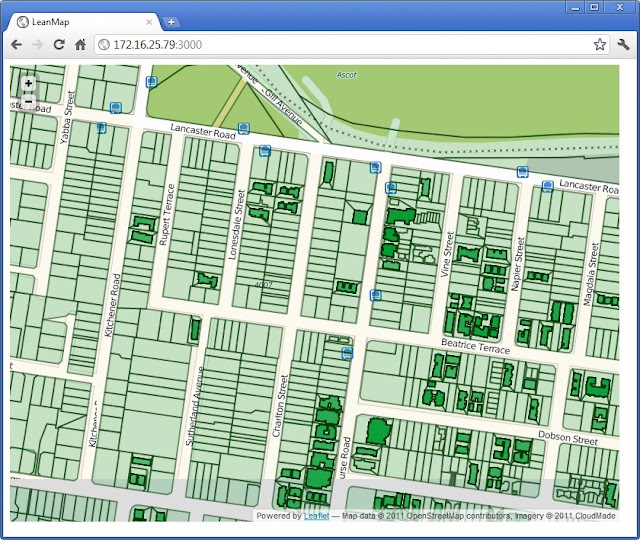 (angularjs + openlayers + nodejs + geoserver + postgis) , i wanna use the WFS-T service for map drawing tool. Awesome post,its so much informative for the followers and so much helpful also.I appreciate you for this great post.Thanks for sharing.Keep it up. Thank you for sharing this information. This article is very interesting and useful. Keep up the good work! It is really a nice and useful piece of information. Thank you for giving me the information. Thanks for sharing the technical information. It is really such an informative blog, thanks for the post.